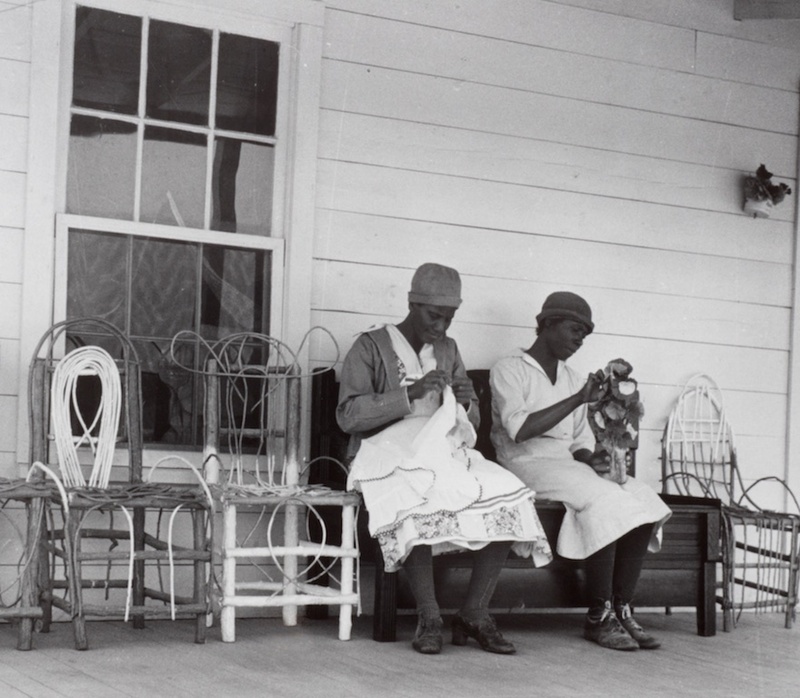 A Marion Post Wolcott photograph from 1939 features Jennie Pettway and her mother Joerina stitching chair covers on the porch of their Roosevelt house. Quiltmaker Arlonzia Pettway (b. 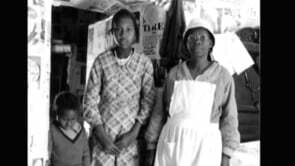 1923) describes her quiltmaking beginnings and acknowledges her mother-in-law, Jennie Pettway, as an artistically liberating influence. The first quilt I made by myself, I was thirteen years old at my mama’s house. It was a "Nine Patch." My mother had taught me to use those old tore-up clothing and make it into plain quilts. Before I married, I was wanting to make pretty quilts, fancy quilts, and my aunt Mattie Ross gave me some patterns to go by. I made up five pattern quilts for my marriage. After I was married, my mother-in-law, Jennie, taught me how to make different "Housetops" and "Hog Pen Pole" quilts and "Lazy Gals," and how to just follow my imagination. I had not made that sort of stuff, ’cause I thought they was ugly, but when my mother-in-law learned me how to make them beautiful, I didn’t want to make nothing else. I watched her tear up old dress tails and make a quilt any kind of way she wanted to. I kind of put together what I learned from my mama and added to it Mattie Ross’s suggestions. And Jennie Pettway told me, "You don’t have to worry yourself trying to make a ‘Star of Bethlehem’ or any of those things you got to follow a pattern for. Just take what you know and do what you want to." And that’s what I did, and I do it yet, and it’s a good way, too. It was when my mother-in-law told me I didn’t have to follow nobody’s ideas that I learnt myself to follow my head. The women of Gee’s Bend—a small, remote, black community in Alabama—have created hundreds of quilt masterpieces dating from the early twentieth century to the present. Gee’s Bend: The Women and Their Quilts tells the story of this town and its art. This uplifting, Emmy-winning PBS film tells the modern-day "Cinderalla" story of the quiltmakers of Gee's Bend, Alabama. Artists born into extreme poverty, they live to see their quilts hailed by a The New York Times art critic as "some of the most miraculous works of modern art America has produced."